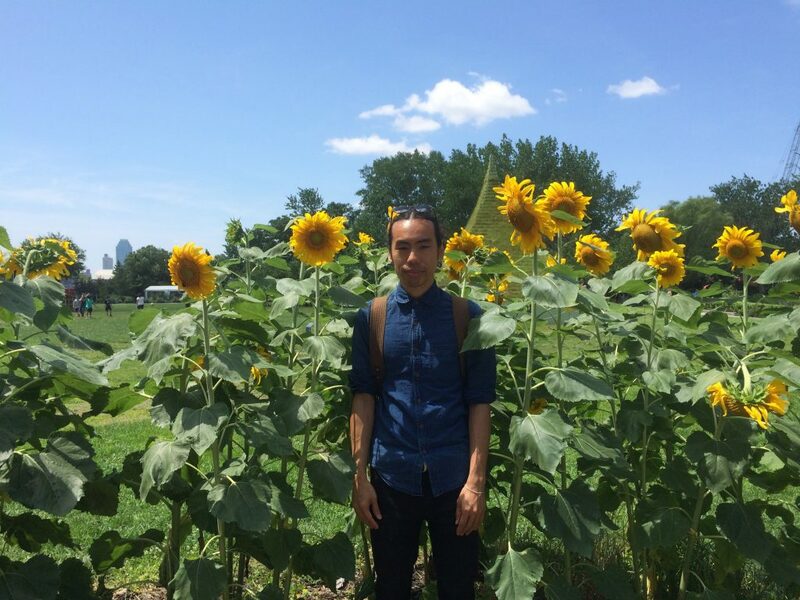 Monday, July 13, 2015 – Many of Socrates Sculpture Park’s visitors may may have noticed a growing row of sunflowers without realizing that they are watching a carefully thought-out miniature ecosystem. Called Urban Forest Lab Project, by New York-based artist Casey Tang, the project at first appears to be a bit of an oxymoron. Not many would consider the planting of a forest to be a lab project, and even fewer would imagine a small landscape of trees and plants in an urban setting when thinking about a “forest.” However, the ongoing work embraces and confronts each aspect of its name. In September 2011 Tang approached Socrates with a proposal to turn a small stretch of the park’s land into a self-sustaining garden. Since that initial conversation, Tang and the park have collaborated to make it happen, beginning with preparing the soil for housing a variety of plants. The process began with a soil test, which Tang did with the help of Cornell’s Cooperative Extension, a resource for community gardeners and farmers. Once testing showed that the soil was workable, Tang set off to convert the park’s compact, sandy ground into a nutrient-rich foundation. The small ecosystem that Tang is creating is composed of clover, alfalfa plants, sun hemp, turnips, peas, and a towering array of blooming sunflowers. None of these plants exist without purpose. He calls them cover-crops, which work to enrich the soil. The sunflowers’ far-reaching roots pull sustenance from the soil’s depths, and the widespread clover patches convert nitrogen in the atmosphere into nutrients that can be used by plants.